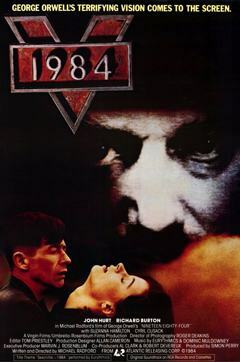 Nineteen Eighty-Four is based on George Orwell's novel of the same name. The population are subjected to psychological and physical slavery under the draconian rule of a global fascist one-party state. Julia is the woman who opens up the crack in Winston’s psychological defenses. He is already starting to have doubts about the world he lives in, when he meets Julia and falls in love. This breaks the strict social rules of the regime they live in, and so the adventure begins. Julia is always portrayed as a somewhat ambiguous character in the movie – as with all the other citizens of Eurasia she is forbidden from publicly expressing any thoughts discordant with ‘The Party’, and you are left wondering exactly what is on her mind. She leads Winston on a journey full of ‘thoughtcrime’ and ultimately betrays him to ‘The Party’, but we never fully see her intentions. Is she a willing tool of the Party, or is she just behaving in the inevitably inconsistent manner of a Eurasia inhabitant? As the movie closes, we are left with a ray of hope, though as always it is deeply obscured by the inscrutable external face of a person under extreme psychological duress. Winston Smith: It’s not so much staying alive, it’s staying human that’s important. What counts is that we don’t betray each other. Julia: If you mean confessing, we’re bound to do that. Everybody does. You can’t help it. Winston Smith: I don’t mean confessing. Confessing isn’t betrayal. I mean feelings. If they can make me change my feelings. If they can stop me from loving you, that would be real betrayal. Julia: They can’t do that. It’s the one thing they can’t do. They can torture you, make you say anything. But they can’t make you believe it. They can’t get inside you. They can’t get to your heart. Cyril Cusack as Charrington in Nineteen Eighty-Four: "Oranges and lemons, say the bells of St. Clements..."
James Walker as Syme in Nineteen Eighty-Four: "It's a beautiful thing, the destruction of words." Heinrich George as Grot in Metropolis: "Where are your children??! The city lies underwater, the shafts are completely flooded -!! Who told you to attack the machines, you idiots? Without them you'll all die!!" Hugo Weaving as 'V' in V For Vendetta: "People should not be afraid of their governments. Governments should be afraid of their people." Ethan Hawke as Vincent Freeman in Gattaca: "I belonged to a new underclass, no longer determined by social status or the color of your skin. No, we now have discrimination down to a science."